Coming off of their recent No. 1 album on the Billboard Top 200 Chart in the US with Dark Before Dawn last week, BREAKING BENJAMIN have been confirmed to headline the inaugural Axes & Anchors music cruise. The guitar-dominated cruise departs February 20th, 2016 from Miami, Fl and sails to Key West and Nassau, Bahamas before returning on February 24th, 2016. The annoucnement marks the first time that BREAKING BENJAMIN will perform on a music cruise. The band will be playing two live sets, host a Q&A session for fans, and hold a meet & greet for passengers along with other acitivities on the ship. Cabins (tickets) are available from the Axes & Anchors website at AxesAndAnchors.com or by calling (775) 600-2937. 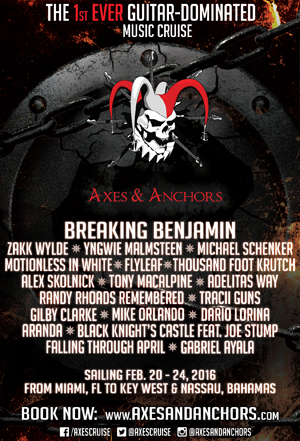 BREAKING BENJAMIN joins an already impressive lineup of previously announced performers including Zakk Wylde, Yngwie Malmsteen, Michael Schenker, Motionless In White, Flyleaf, Thousand Foot Krutch, Alex Skolnick, Tony MacAlpine, Adelitas Way, Randy Rhoads Remembered, Tracii Guns, Gilby Clarke, Mike Orlando, Dario Lorina, Aranda, Black Knight’s Castle featuring Joe Stump, Falling Through April and Gabriel Ayala. More artists will be announced over the coming weeks. The cruise guarantees fans plenty of opportunities for meeting and hanging with their favorite bands on board, including private music lessons and free workshops on topics ranging from guitar and vocals to concert photography to stage clothing construction. Passengers are encouraged to bring their guitars on board for workshops and jam sessions. 28 total workshops are currently listed online with more to be added before Axes & Anchors sets sail in February. The five days and four nights cruise to Key West and Nassau, Bahamas will take place on the Carnival Victory. The ship offers free gourmet food and 24-hour room service, live comedy and theater shows daily, and 40 live concerts on multiple stages. It also has three large swimming pools: King of the Seas, Triton, and Sirens, all including whirlpools in the immediate area. There is also a 214-foot-long (65 m) “Twister” waterslide that ends next to the King of the Seas pool. The cruise ship also has 13 bars, a salon/spa, a fitness center, and more amenities available. All reservations include 4-nights lodging and taxes, all meals, all concerts, all open workshops, a professional photo opportunity with every artist, and more. Current promotions include a $150 per person rebate by paying in full, and the recently announced Stowaway Package, which allows 3rd and 4th passengers in a cabin who are under 21 to cruise for free when accompanied by two passengers over 25 years old.